Deep Springs admitted its first class of students in the fall of 1917. On the 30th of June, 2017, the college began three days of festivities to commemorate one hundred years of education. 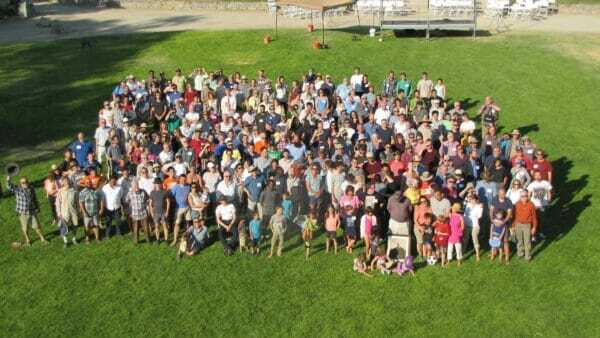 While Deep Springs’ normal campus population is only forty five, over five hundred guests came for the weekend get-together. (Half of them are pictured above on the main lawn.) Most folks camped in tents along the alfalfa fields and everyone dined outdoors in tents erected on either side of the Boardinghouse just for the occasion. 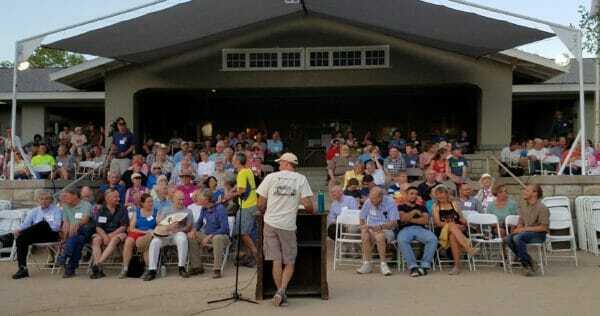 Among the attendees were 230 alumni, representing sixty-five different class years and nearly one third of all living alumni. Also among the guests were some seventy kids, two dozen faculty, and many family members. Festivities included socializing around the campfire, a Public Speaking series by visiting alumni, guided nature tours around the valley, launching of a new digital photo archive, publication of DSC100: Deep Springs College (a commemorative collection of over 200 images and 150 essays about a century of experiences at Deep Springs), a surprise visit by the ghost of LL Nunn, and an evening concert with student and alumni performances highlighted by David Wax DS’00 and his wife Suz Slezak. Seminar discussions were held on Saturday and Sunday; topics included the unique science curriculum opportunities at Deep Springs, the experience of women faculty in an all-male student environment, the evolution of student self-government over a century, and the future of Nunnian education on a Deep Springs model for a new generation of education pioneers. In his opening remarks, President David Neidorf announced that the college had just received confirmation the California Supreme Court would let stand lower court decisions allowing the college to admit women as students. President Neidorf also discussed Deep Springs’ financial plans for the near future and unveiled initial design proposals for replacement of the Boardinghouse, which is the oldest non-ranch building on campus. Despite concerns that the campus may be overwhelmed by increasing the population tenfold, all participants reported having a wonderful time. 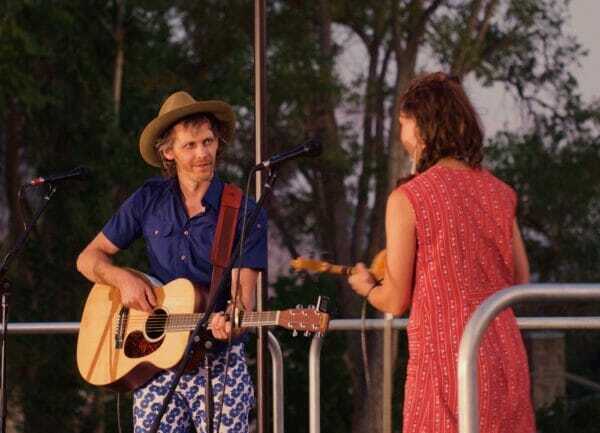 Activities spread across multiple locations, there was plenty of food, shade and seating for meals, and campers were comfortably located throughout the farm’s 150 acres. 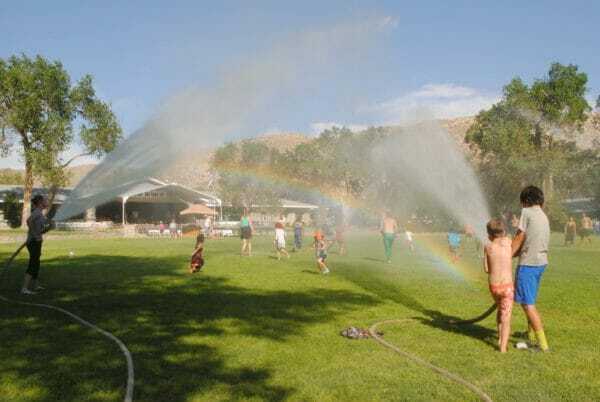 The weather cooperated perfectly and kids enjoyed some artificial showers each afternoon when the Deep Springs fire brigade brought out the fire hoses to cool everyone off. It was a very special occasion for a very special college. Many generations came together to celebrate their shared memories and hopes for this unique educational enterprise as we wrapped up one century and began another. 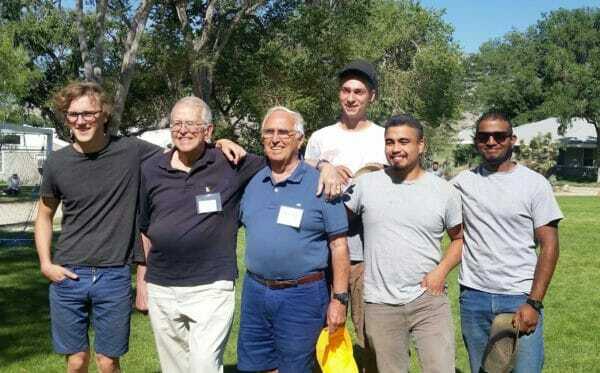 In this photo from the last day, our oldest attendees – Bob Gatje DS’44 and David Cole DS’45 – stand in arms with the youngest – Elliot Setzer D’15, Josh O’Neil DS’16, Jesus Munoz DS’15, and Ikhzaan Saleem DS’15. 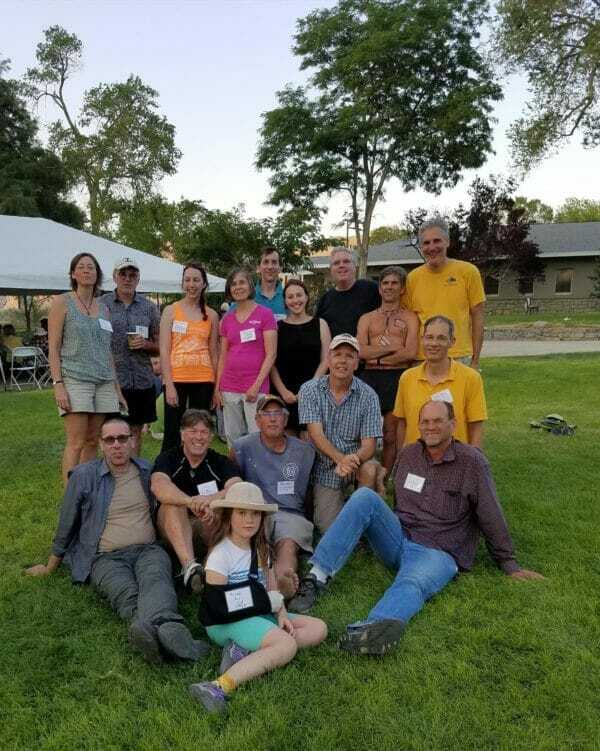 Only five days after the reunion wrapped up, new students for the 101st class of Deep Springs (DS2017) arrived to begin the next academic year. We are preparing a short video documentary of the entire weekend that will be available as a keepsake both for those who attended and those who missed it. Stay tuned!